Canadian font designer Peter Rempel brings his love of handwritten letterforms to the screen with a free download of PR Uncial, a playful introduction to the art of calligraphic forms. 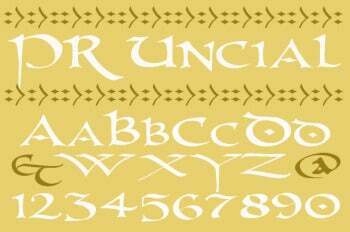 PR Uncial brings medieval style to the screen with bold, round strokes. Time was when letterforms came about from hand and nib not click and pixel. Beginning around 200 AD, a particular style known as Uncial was the go-to choice of scribes writing out Latin and Greek texts. Uncial relies on simple, rounded strokes from a pen held in one position. Hardworking copyists kept this simple style fashionable for centuries. In fact, as Rempel shows in this font design, Uncial never gone out of fashion. An early start drawing Uncial letterforms has inspired many of the designer’s works, including PR Viking, another PCWorld favorite. In 1996 Rempel acquired a Windows PC with font editing software. Glitch-free file transfer between MAC and PC was a ways off, so the designer had a friend scan a print out, then redrew the forms in vector format, cleaned up the curves in CorelDraw 4 and finally brought the file into Fontographer 4 for serious editing. Personal preferences abound in PR Uncial. Rempel based his forms on a rounded “O”, rather than the more angular set of strokes that the early Uncials are known for. The designer used a global editing function to stretch the letters one and a half times their original width, further emphasizing that roundness. Global stretching of a font can create problems. Case in point: PR Uncial’s D, with a posture that too closely resembles an O and would have been better served with an angular stroke and a narrower stance. Like Uncials of old, PR Uncial has no lowercase. Instead, it presents a duplicate set of scaled-down capitals. The absence of a lowercase, the addition of pen ornamentation in the middle of letters like O, Q and D, and the horizontal stretch in the overall forms guarantees a slow read if the font is used for text font even though a range of punctuation, monetary and other useful symbols are included. Still, points to Rempel for giving us an old-style ampersand showing the original ligature of the letters E and T (“et” is Latin for "and") , as well as a cat-tailed @ sign. PR Uncial is best used in display work, at sizes 24 points and above. Pay attention to spot kerning the letter pairs, avoid any confusion the D might bring about and you’ll be rewarded with a touch of medieval style that still shines. PR Uncial is no slouch when putting short titles such as Billy Goats Gruff and The Sword in the Stone through their paces. Sadly, that D problem makes it a poor choice for A Dance With Dragons. This download is free for non-commercial use. Rempel is currently working on an updated, commercial version that will include a true lowercase based on half-uncial forms with full support for West European languages, as well as a ligature set and alternate characters. He has a fine start in PR Uncial, where practice with nib and paper do a more than passable job of bringing a centuries-old style to today’s glowing screens.